Anyone who truly loves the written word will understand the thrill one has in looking into this face. T S Elliot, no mean writer himself, once said, "Dante and Shakespeare divide the world between them -- there is no third." How this man could write as he did, how he could construct characters as he did, how he could enter so fully and masterfully into so many types of writing, is something that it is beyond my mind's ability to grasp. 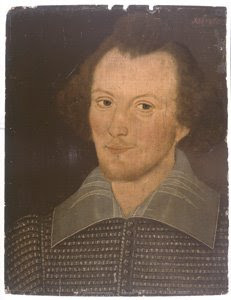 And this may be the only picture ever made of William Shakespeare while he was alive. Its existence was just announced today in Britain. Then again, this might be another one. 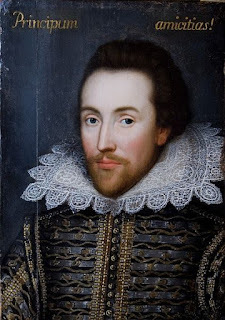 I have a visceral urge to see as many portraits as I can -- probably in some subconcious, vain attempt to stare into his eyes and understand him.